Cornus florida 'Cherokee Sunset' showcases large, creamy pink flower bracts surrounding tiny green inner flowers during spring. This Pink Flowering Dogwood also displays new green leaves with distinctive pink edges that turn yellow as the summer progresses, settling into warm hues of purple and pink in autumn. Often, the multi-coloured foliage can continue to be a mixture of yellow-edged leaves and some with pink edges as the seasons change. With an eventual height and spread of about 4 x 4 metres, this feature packed Dogwood makes a very interesting specimen tree or large shrub for any garden. Cornus 'Cherokee Sunset' is suited to all soils and grows well in a sunny position but will also tolerate partial shade. Our pot grown Cherokee Sunset Dogwood trees can be planted at any time of the year. Start by removing weeds and grass within a metre of your desired planting hole, then dig a square hole as deep as your root mass and roughly 1.5x as wide. To help the plant establish, sprinkle Mycorrhizal Fungi in the hole. If you’re planting Cherokee Sunset in spring or summer, water well and regularly for the first few months. Take care to water the soil, not the leaves which can lead to scorching - irrigation kits make this easier. Increase watering in extended periods of hot or dry weather, but avoid over watering as Dogwood does not like wet soil. If you’re planting in autumn, you may only need to water a little. Once planted, keep the area free of competing weeds and grass for the first few growing seasons. Don't mulch around the base of Flowering Dogwood with bark. 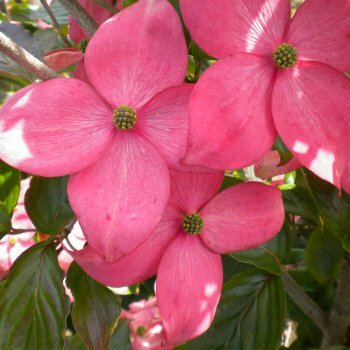 Most Pink Flowering Dogwood trees naturally grow into an appealing dome-shape, so the only pruning required is to remove any damaged or diseased branches. The only time to hard prune a Dogwood tree is to control the overall size or internal canopy or if there is not enough light reaching the inner branches.